What's the difference between murder and massacre? 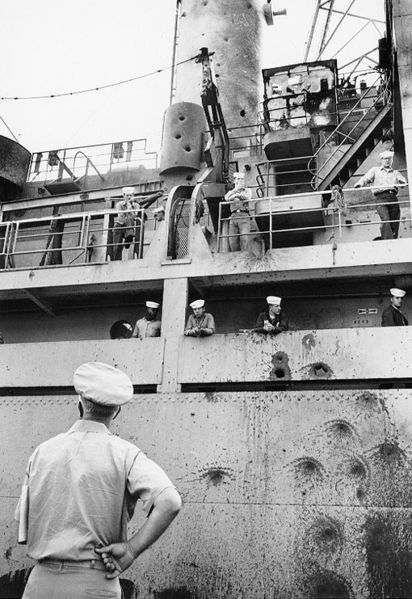 The date was June 8, 1967; and for the families of the 34 murdered and for the Liberty's survivors and their families, it is a "date which will live in infamy" -- like the date of an earlier surprise attack on the U.S. Navy. The infamy is two-fold: (1) the Liberty, a virtually defenseless intelligence collection platform prominently flying an American flag in international waters, came under deliberate attack by Israeli aircraft and three 60-ton Israeli torpedo boats off the coast of the Sinai on a cloudless June afternoon during the six-day Israeli-Arab war; and (2) President Lyndon Johnson called back carrier aircraft dispatched to defend the Liberty lest Israel be embarrassed -- the start of an unconscionable cover-up, including top Navy brass, that persists to this day. Given all they have been through, the Liberty survivors and other veterans -- who joined Halbardier to celebrate his belated receipt of the Silver Star -- can be forgiven for having doubted that this day would ever come. In the award ceremony at the Visalia (California) office of Rep. Devin Nunes, the Republican congressman pinned the Silver Star next to the Purple Heart that Halbardier found in his home mailbox three years ago. Nunes said, "The government has kept this quiet I think for too long, and I felt as my constituent he [Halbardier] needed to get recognized for the services he made to his country." As we gathered in Congressman Nunes's office, I could not get out of my head the contrast between this simple, uncomplicated event and the rigmarole that senior Navy officers went through to pin a richly deserved Medal of Honor on another hero of that day, the Liberty's skipper, Captain William McGonagle. 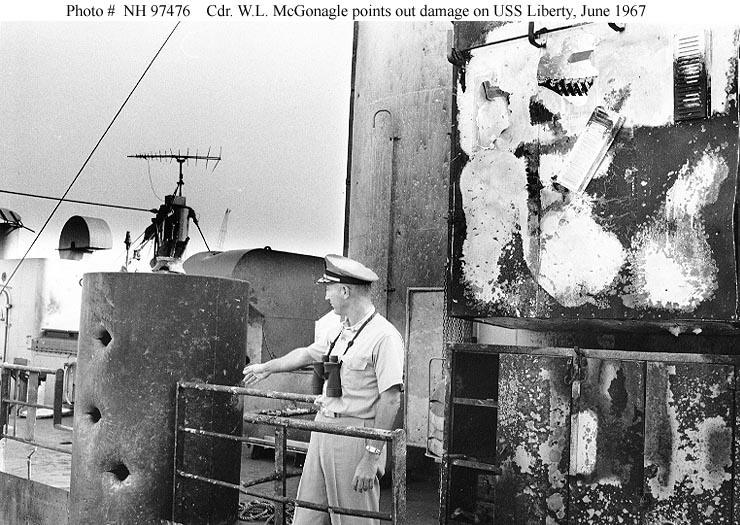 I remembered what a naval officer involved in McGonagle's award ceremony told one of the Liberty crew: "The government is pretty jumpy about Israel... the State Department even asked the Israeli ambassador if his government had any objections to McGonagle getting the medal." Please don't misunderstand. The Liberty crew is not big on ceremony. They are VERY-not-big on politicians who wink when Navy comrades are killed and wounded at sea. The Liberty survivors are big on getting the truth out about what actually happened that otherwise beautiful day in June 1967. Last Wednesday's award of the Silver Star to Terry Halbardier marked a significant step in the direction of truth telling. Is it too much to hope that the example set by Nunes may embolden other lawmakers to right the wrongs done to their Liberty-veteran constituents -- and thus to chip away at what's left of the cover-up? Halbardier said he accepted his Silver Star on behalf of the entire 294-man crew. 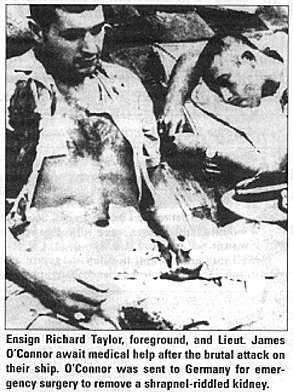 He and fellow survivor Don Pageler expressed particular satisfaction at the wording of the citation, which stated explicitly -- with none of the usual fudging -- the identity of the attackers: "The USS Liberty was attacked by Israeli aircraft and motor torpedo boats in the East Mediterranean Sea..." In the past, official citations, like Captain McGonagle's, had avoided mentioning Israel by name when alluding to the attack. I think former U.S. Ambassador Edward Peck put it best in condemning this kind of approach as "obsequious, unctuous subservience to the peripheral interests of a foreign nation at the cost of the lives and morale of our own service members and their families." Strong words for a diplomat. But right on target. Were it not for Halbardier's bravery, ingenuity, and technical expertise, the USS Liberty would surely have sunk, taking down much -- if not all -- of the crew. Israeli commando helicopters were ready to take care of any personnel still that survived the sinking. The first thing the Israeli aircraft bombed and strafed were the Liberty's communications antennae and other equipment. They succeeded in destroying all the antennae that were functional. One antenna on the port side, though, had been out of commission and had escaped damage. In receiving the Silver Star, Halbardier made light of his heroism, claiming that he was just a guy from Texas who could do a whole lot with simple stuff like baling wire. (In the infantry we called this kind of thing a "field expedient.") In any case, with his can-do attitude and his technical training, he figured he might be able to get that particular antenna working again. But first he would have to repair a cable that had been destroyed on deck and then connect the antenna to a transmitter. Voila. "Mayday" went out; almost immediately the Israeli aircraft and torpedo ships broke off the attack and went back to base; the Israeli government sent a quick apology to Washington for its unfortunate "mistake;" and President Johnson issued orders to everyone to make believe the Israelis were telling the truth -- or at least to remain silent. 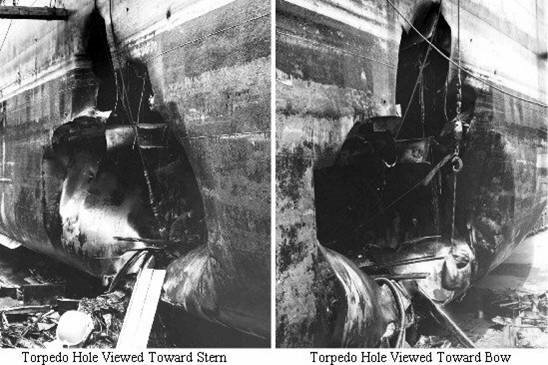 Above:Main blast area of USS Liberty. To their discredit, top Navy brass went along, and the Liberty survivors were threatened with court martial and prison if they so much as mentioned to their wives what had actually happened. They were enjoined as well from discussing it with one another. As Liberty crewman Don Pageler put it, "We all headed out after that, and we didn't talk to each other." The stories shared by Liberty survivors after the award ceremony, including descriptions of the macabre but necessary effort to reassemble torpedoed body parts, and the plague of survivor's guilt, were as heart-rending as any I have heard. They are stories that should be shared more widely for those muzzled far too long -- those who, even 42 years later, might be helped by being in contact with other Liberty survivors, and being able to talk about it. These were the deep emotional scars to supplement the ones all over Halbardier's body, some of which he uncovered when asked by the local press gathered there in Visalia. Typically, Halbardier made light of the shrapnel that had to be plucked out of his flesh, emphasizing that he was lucky compared to some of the other crew. Despite Israeli protestations, the accumulated evidence, including intercepted voice communications, is such that no serious observer believes Israel's "Oops" excuse of a terrible mistake. Israeli pilot to ground control: "This is an American ship. Do you still want us to attack?" Ground control: "Yes, follow orders." Israeli pilot to ground control: "But sir, it's an American ship -- I can see the flag!" Ground control: "Never mind; hit it!" Haviland Smith, a CIA officer stationed in Beirut during the Six-Day War, says he was told that the transcripts were "deep-sixed," because the U.S. government did not want to embarrass Israel. "The chief of the analysts studying the Arab-Israeli region at the time told me about the intercepted messages and said very flatly and firmly that the pilots reported seeing the American flag and repeated their requests of confirmation of the attack order. Whole platoons of Americans saw those intercepts. If NSA now says they do not exist, then someone ordered them destroyed." As for the legal side: the late Captain Ward Boston, unburdened himself on his accomplice role as the Navy lawyer appointed as senior counsel to Adm. Isaac Kidd, who led a one-week (!) investigation and then followed orders to pronounce the attack on the Liberty a case of "mistaken identity." Boston signed a formal declaration on Jan. 8, 2004, in which he said he was "outraged at the efforts of the apologists for Israel in this country to claim that this attack was a case of 'mistaken identity.'" "The evidence was clear. 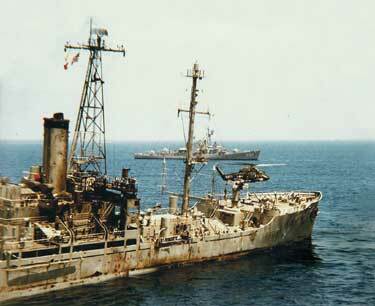 Both Adm. Kidd and I believed with certainty that this attack ...was a deliberate effort to sink an American ship and murder its entire crew ... Not only did the Israelis attack the ship with napalm, gunfire, and missiles, Israeli torpedo boats machine-gunned three lifeboats that had been launched in an attempt by the crew to save the most seriously wounded -- a war crime ..."
"I know from personal conversations I had with Adm. Kidd that President Lyndon Johnson and Secretary of Defense Robert McNamara ordered him to conclude that the attack was a case of 'mistaken identity' despite overwhelming evidence to the contrary." "The flight commander was reluctant. That was very clear. He didn't want to do this. He asked them a couple of times, 'Do you really want me to do this?' I've remembered it ever since. It was very striking. I've been harboring this memory for all these years." Lang, of course, is not alone. So too Terry Halbardier, who told those assembled last Wednesday, "I think about it [the attack on the Liberty] every day." 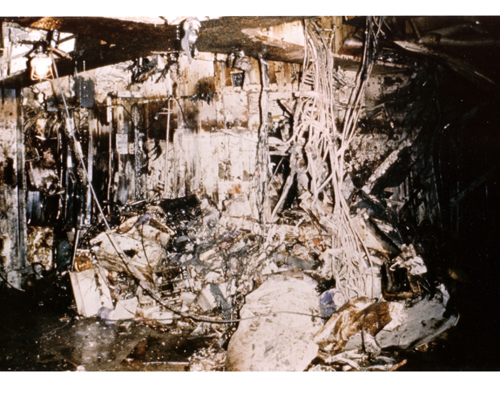 What we know for sure is, as the independent commission headed by former Chairman of the Joint Chiefs of Staff, Adm. Thomas Moorer put it, the attack "was a deliberate attempt to destroy an American ship and kill her entire crew." "In June 1967, we had a choice. The Egyptian army concentrations in the Sinai approaches do not prove that [Egyptian President] Nasser was really about to attack us. We must be honest with ourselves. We decided to attack him." Thus, the Israeli attack admittedly amounted to starting a war of aggression, and the occupied West Bank territories and the Golan Heights -- gained by the Israelis in the 1967 war -- remain occupied to this day. The post WWII tribunal at Nuremberg distinguished a "war of aggression" from other war crimes, terming it the "supreme international crime, differing from other war crimes only in that it contains the accumulated evil of the whole." "There's lots of theories but let's just say they didn't want us listening in to what they wanted to do." In sum, on June 8, 1967, the Israeli government learned that it could get away with murder, literally, and the crime would be covered up, so strong is the influence of the Israel Lobby in our Congress -- and indeed, in the White House. 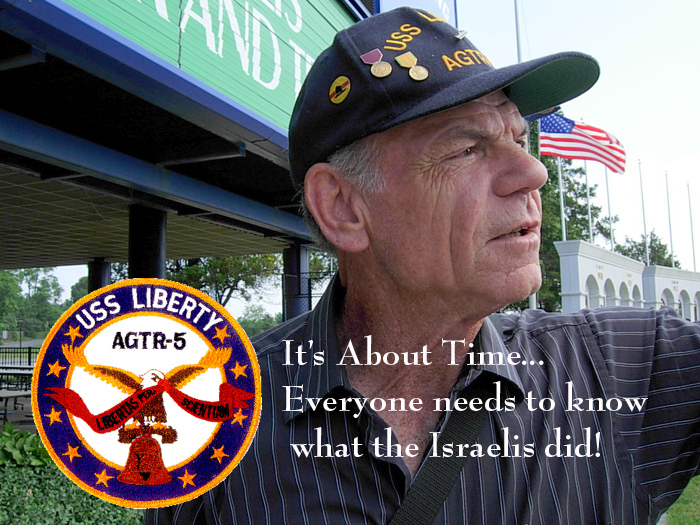 And those USS Liberty veterans who survived well enough to call for an independent investigation have been hit with charges of, you guessed it, anti-Semitism. Benjamin Netanyahu, the new Israeli Prime Minister has now had an up-close-and-personal chance to take the measure of our new president and has already thumbed his nose at Barack Obama's plea for a halt in illegal construction of Israeli settlements in the occupied territories. The Israelis seem convinced they remain in the catbird's seat, largely because of the Israel Lobby's influence with U.S. lawmakers and opinion makers -- not to mention the entrée the Israelis enjoy to the chief executive himself by having one of their staunchest allies, Rahm Emanuel, in position as White House chief of staff. Netanyahu is currently whipping up frenzy and fear in the face of what he calls the "existential threat" posed by Iran -- frenzy about the "danger" from Iran that could lead to military action of some kind. So confident is Netanyahu of the solidity of his position with movers and shakers in the U.S. that he may be sorely tempted to mount the kind of provocation that would be aimed at confronting Obama with an unwelcome choice between joining an Israeli attack on Iran or facing dire political consequences at home. And nothing is outlandish any more. Remember Seymour Hersh's report about Cheney's office conjuring up plots as to how best to trigger a war with Iran? "The one that interested me [SH] the most was why don’t we build -- we in our shipyard -- build four or five boats that look like Iranian PT boats. Put Navy Seals on them with a lot of arms. And next time one of our boats goes to the Straits of Hormuz, start a shoot-up." 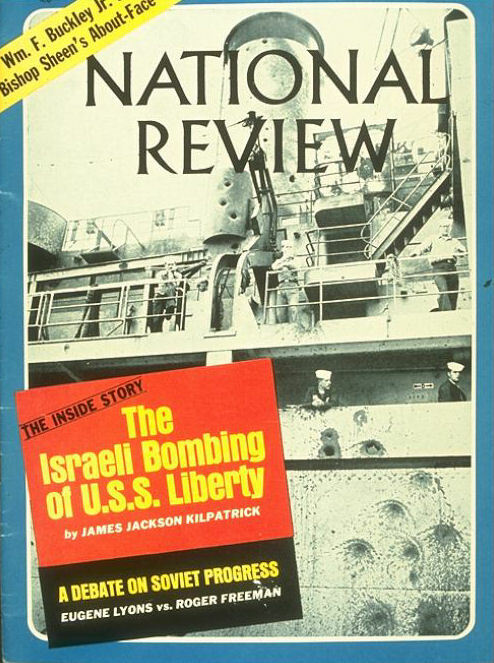 We learned from the Israeli press that Mullen, to his credit, went so far as to warn the Israelis not to even think about another incident like the attack on the USS Liberty on June 8, 1967 -- that the Israelis should disabuse themselves of the notion that U.S. military support would be knee-jerk automatic if Israel somehow provoked open hostilities with Iran. This is the only occasion of which I am aware when a U.S. official of such seniority braced Israel about the Liberty incident. A gutsy move, especially with Cheney and Elliott Abrams then in the White House, two hawks who would bless -- or even encourage — an Israeli provocation that would make it very difficult for Washington to avoid springing to the defense of its "ally." "Israel didn't ask us permission to drop bombs twice on Syrian nuclear facilities. I don't hear America scolding Israel for what it did then. Hypothetically, if Israel were able to get rid of Iran's nuclear bomb-making capability, I'm sure that America would not send Israel a chastising email message. We have to give Israel the courtesy of [allowing it to] make its own decisions." For good measure, Lautenberg said Israel "won't return to the '67 borders. They are insufficient to permit Israel to function." Let me ask again: Will Netanyahu give more weight to Mullen over Lautenberg and a pro-Israel U.S. Secretary of State (Hillary Clinton) who spoke about "obliterating" Iran during last year's campaign? In gauging President Obama's clout with the Washington power-brokers, Netanyahu is likely to draw conclusions more from things like Obama's inability, or reluctance, to turn off the feckless, counterproductive sabotage squads inside Iran, than from any warnings Netanyahu may have heard from the president to please not attack Iran. COMMENT: The wrongful destruction of the U.S. Liberty and its personnel is not to be denied The record does show that Israel "compensated" the U.S.S. Liberty crew. Even though there never could be enough money compensation, this fact is not to be denied. In the realm of a nation attacking its ally, it should be remembered that Nations sometimes attack their own citizens when they conclude it is in the natiional interest. This happened at Pearl Harbor. And Pearl Harbor was more deeply planned than the attack on the U.S.S. Liberty. In the realm of global intrigue and complicated maneuvers among nations, one must not ignore that strange and dangerous acts occur. Lastly, the alliance between the U.S. and israel cannot be conditioned today upon the act o Israel against our ship in the past. I pray that the brave souls who perished in peace. 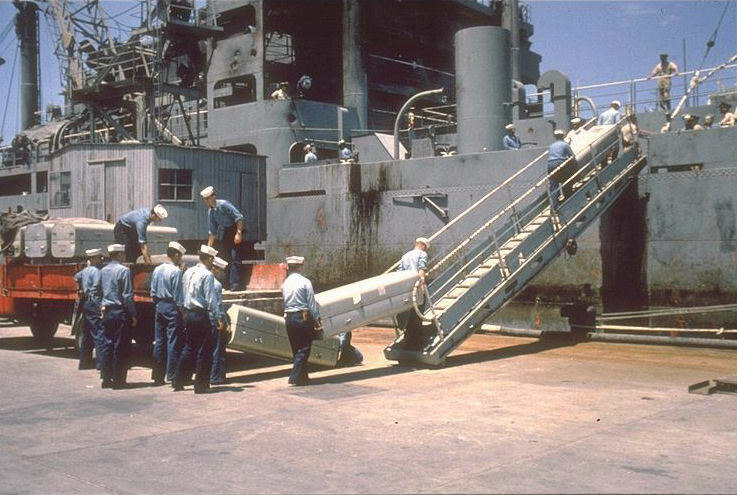 The Philadelphia Experiment Did the US Navy succeed in making the USS Eldridge invisible?